*now booking shasta lake trophy trout fishing trips. please click the “book a trip” button and msg us to check on available dates. Thank you! Late November kicks off our trophy Shasta Lake brown and rainbow trout fall/winter fishing season. As these big adult rainbows and browns prepare for their spawning season in the Shasta Lake tributaries, we are preparing to catch some of our biggest trout of the year during their migrations up and down the lake. We hunt trophy trout, but we can also go to known locations where we catch good numbers of 16”-18” rainbow trout if the trophy hunting is too slow. Either way, we will catch fish and we always have a great time on the water with our clients! Jeff Goodwin’s Guide Service offers year-round fully guided sport fishing trips on Northern California lakes and the Sacramento River. We can accommodate large groups with multiple guides or just spend the day fishing with your party of two! With very competitive pricing and a reputation for being the top lake fishing charter in northern California, your decision to fish with us should be without hesitation. We guide our clients year round, while running around 200 trips per year on our Northern California waters. As a full time professional fishing guide and charter captain, I can offer our guests the very best experience the fishing industry has to offer. 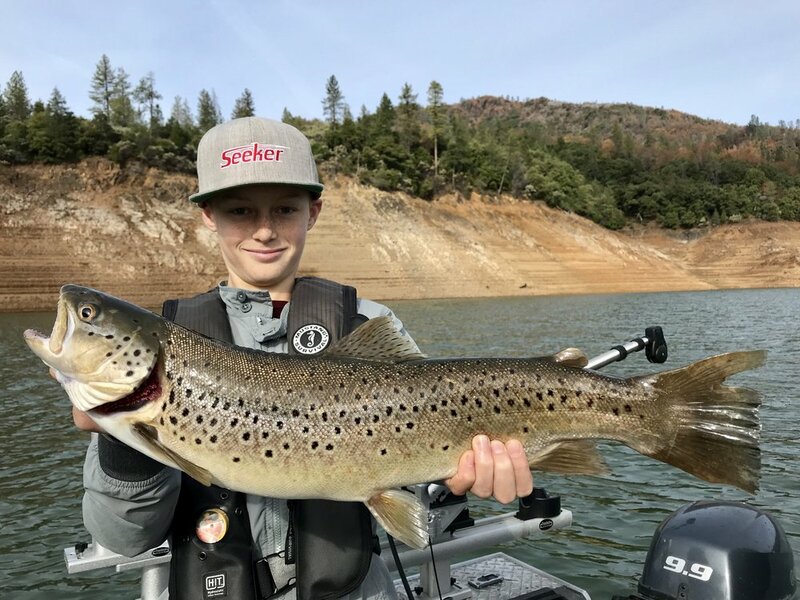 As a top choice for lake and river fishing charters in Redding California, we offer some excellent guided fishing opportunities on Shasta, Trinity, Keswick, and Whiskeytown Lakes for landlocked King salmon, Kokanee salmon, rainbow and brown trout, and for Sacramento River salmon, trout, and steelhead all year long. We have become the premier fishing charter on these lakes, and the Sacramento River, by spending hundreds of days on the water every year. Whether you have a large group or a party of two, we book all of our year round trips during the peak periods of each season specific to each body of water. We do this to ensure our fishing clients have the best opportunity to experience catching the fish we are pursuing that day. We do however, experience some of our best trips of the year during off peak periods on the water so don't hesitate to book during these timeframes. Rest assured, I will always give you an honest fishing report, its just how I do business. 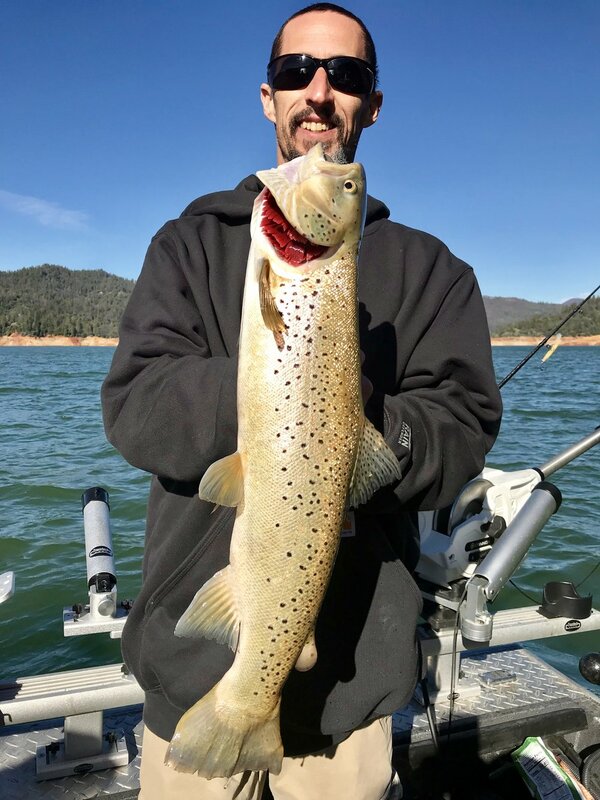 Shasta Lake brown trout fishing report! “We drove up from the San Jose area to fish with Jeff on the Sacramento River. Jeff made sure we were well taken care of- great boat, great gear, always making sure we had fresh tackle when we got snagged up and lost hooks/weights. We had a trip last year but Jeff called us and let us know fishing was poor and gave us the option to cancel, which we did. His honesty, his efforts to get us fish was very much appreciated. We definitely will use Jeff again!